To see the video and hear more from the musical duo, head over to Mississippi Weekend. BROOKHAVEN, MS (WLBT) - Two Co-Lin students took their love of Zaxby's chicken to a whole new level Sunday night. Zaxby's celebrated the grand opening of their Brookhaven location Monday morning with a year full of giveaways to the first 100 customers. 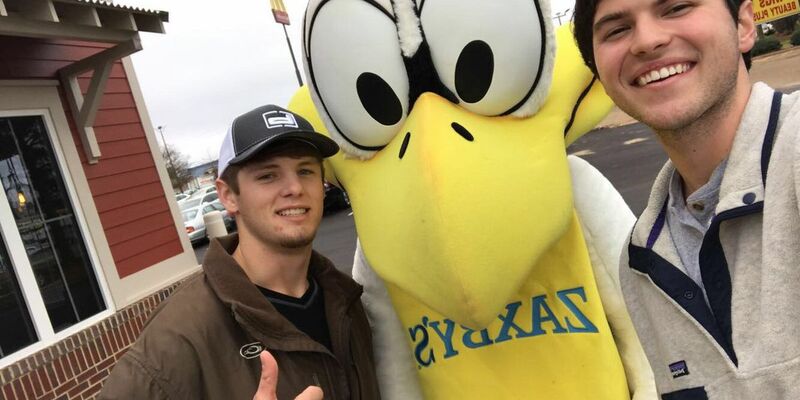 18-year-old Jon Taylor Thames and 20-year-old Fisher Warren took the opportunity to show their dedication to the Southeast favorite for chicken fingers and wings by camping out so they would be the very first ones in line. "It started as a joke," said Fisher Warren. "We never intended it to get this big." Fisher says he originally saw the store was having a grand opening with giveaways on Twitter and posted asking if anyone wanted to camp out. Jon Taylor immediately replied that he was in. With a tent, sleeping bag, chairs and their guitar, the pair filled their time on Super Bowl Sunday with music, singing an original song -- inspired by Johnny Cash's Ring of Fire -- on Facebook Live. As of Monday afternoon, the video has gone viral with over 20,000 views and 400 plus shares. To see the video and hear more from the musical duo, click here to head over to Mississippi Weekend.